FREE SHIPPING!! This is a 7ft collapsible bamboo pole style grass umbrella that's damaged and will have a small hole in thatch but is a new product. These are similar to a market umbrella just made of thick bamboo pole and real sea grass and are foldable. The height is about 8ft and the center pole is about 2 inches in diameter. Bamboo pole can be sanded down for smaller applications. These are made to be portable just like the market umbrellas. It has a two piece pole that unscrews for storage or can be left up year round. 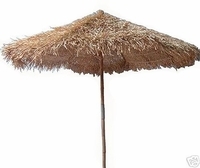 Our bamboo thatch Umbrella is the best commercial grade quality thatch that you can buy. We import containers from Mexico, Philippines, China, Vietnam, Bali and is hand picked for the best quality possible. This item that you have chosen is a great choice to make for your backyard!!! You can turn your backyard in a tropical dream in seconds.